In his first major speech since leaving office, former U.S. President Barack Obama slammed ‘strongman politics’ — an obvious dig at the current President of the United States Donald Trump — and defended globalization. 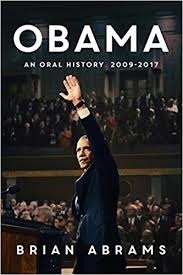 This week on The Halli Casser-Jayne Show we are taking a look at Barack Obama, the man and his presidency when joining me at my table is the author of the hot new book OBAMA: AN ORAL HISTORY 2009-2017, Brian Abrams. 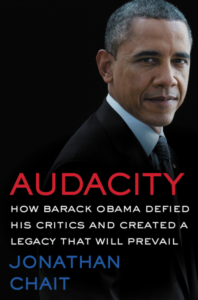 And in the second half hour, I am joined by Jonathan Chait, a political columnist for New York magazine here to talk about his book AUDACITY, HOW BARACK OBAMA DEFIED HIS CRITICS AND CREATED A LEGACY THAT WILL PREVAIL. The podcast will be posted July 18, 3 pm ET at Halli Casser-Jayne dot com. Jonathan Chait is a political columnist for New York magazine. Previously a senior editor at the New Republic he has also written for the Los Angeles Times, the New York Times, the Wall Street Journal, and The Atlantic. He has been featured throughout the media, including appearances on NPR, MSNBC, Fox News, CNN, HBO, The Colbert Report, Talk of the Nation, C-Span, Hardball, and on talk radio in every major city in America. Jonathan Chait comes to The Halli Casser-Jayne Show to talk about his brand new book AUDACITY, HOW BARACK OBAMA DEFIED HIS CRITICS AND CREATED A LEGACY THAT WILL PREVAIL, in which he makes the argument that most of Obama’s achievements will not only survive a Trump administration, but also the judgment of time, which will proclaim that Obama was among the greatest and most effective presidents in American history. Barack Obama, POTUS, Obama administration, politics, Donald Trump, authors, books, The Halli Casser-Jayne has it all for you, Wednesday, July 18 the podcast posted at Halli Casser-Jayne dot com.